It’s not easy to buy a house in Australia without a deposit but it is possible. Here are 7 ways to buy a house without a deposit. I’m going to lay it out straight for you. Trying to purchase a house without a deposit in Australia can be a very difficult thing to do. However it is still possible and so in today’s episode I want to show you nine different ways you can purchase a property without a deposit. Hi, I’m Ryan come from onproperty.com.au your daily dose of property education and inspiration. There are reasons why you might want to purchase a house without a deposit. It might be that you have no money and therefore you need to buy it without the deposit, otherwise you can’t afford to buy a house at all and it might be that you have just paid down debt or could be that you simply don’t want to invest your own money into the deal because you believe you can grow faster if you can work out how to purchase property with little or no deposit. There are many different reasons you might want to invest. What I want to identify for you is how you can buy a house without a deposit. The first method is called an equity loan. This does require that you own a property already. So an equity loan would be used probably for an investment property or maybe for a second house that you are going to move into or holiday house or something like that. An equity loan works in the fact that your first property need to have gone up in value so much that you have equity in that loan. Now, if you want to find out what exactly is equity, what’s Ryan is talking about here, well I have provide a link in the description below or at www.onproperty.com.au/245 and you can see exactly what equity is, if you don’t know what it is already. Basically, equity is the difference between the mortgage that you owe and what the property is actually worth and you can actually access that, increase your loan, borrow that money and purchase another property with that money. If you already have a property, maybe it’s your own house, maybe it is investment property and it has gone up in value. Why not speak to your mortgage broker and consider borrowing equity in order to purchase your next property. The way most people do it is to actually borrow the equity and they take it in cash and they then go and use that cash as a deposit for their second property rather than what’s called cross-collateralization which is where you actually kind of mix the security of the two loans together because that can be very difficult to get out of in the future when you want to sell one property, when you want to do some interesting things with your finances. Speak to your mortgage broker about that one and if you don’t have a mortgage broker go to www.onproperty.com.au/mortgage to get my broker details, Brad the broker who I highly recommend. The second method to get a property without a deposit is a family pledge guarantor. I did cover this in detail with Brad. Again, links below or www.onproperty.com.au/245 and it will tell you exactly what a family pledge guarantor loan is, how you can go about getting one. However, I’m going to cover it in short in today’s episode. Basically, what a guarantor family pledge loan is your family member also, maybe it’s your parent’s, your grandparents, your brother or your sister, something like that. It generally needs to be an immediate family who actually put up some security for you to purchase your investment property. Rather than put up the security for the whole property which is what used to happen in the past, then they need to put up the security for the deposit that you don’t have, up to 20% and so you would borrow 100% from the loan which is secured by your property, but 20% of that loan is also secured against another property that your family member owns. So this basically counteracts the fact that the bank is taking a high risk in you lending you more money. Well, they now have more security to offset that money that they are lending. Your family members do need to have a property that they can put up as security. The good thing about a family pledge loan is that if your property goes up in value or you pay down a debt, you can actually get your family’s property removed as security and so it would be just your property that is secured against it, once you get to that 80% loan to value ratio. The third method is owner’s finance. This is very common in the US but not so common in Australia, but still completely possible. Owner’s finance is when the seller of the property actually provides you with the finance rather than the bank. In a general transaction, you will go to the bank, you will borrow the money for the property, you’ll have your deposit as well and you then take that cash and you would give it to the seller and they would give you the title deeds or they will give the bank the title deeds until you pay off with the bank. But with owner’s finance, you cut the bank out of it completely, you go to the seller and you say, I’d like to buy your property off you, you provide the finance to me and I’ll pay you back overtime. So the owner would provide finance to you, they will keep the title deed but you will own the property, contracts and stuff like that and then when you finish paying off you will then receive the title deed and effectively own the property. By buying through owner’s finance, it’s very similar to regular financing that you will have control of that property and be able to rent it out and do whatever it is you want to do with it. However, you will have a loan with the person who originally owned the property. That’s owner’s finance in a nutshell. The fourth method is by doing a joint venture. You might not have a deposit but you might earn a good income. You might not have a deposit but you might have skills when it comes to investing in property. You might be a trade’s man or you might have some handyman skills or your might be able to find positive cash flow property like I can but you might not have that deposit. But what you can do is joint venture with someone else, partner up with them and if they have the deposit, you can go halvies in the property or you can work out whatever arrangements it is you want to work out. It is up to you, how you negotiate that. Basically, your joint venture partner will provide the deposit, potentially some financing help as well and then you would provide the financing or you would provide some legwork that’s going to increase the property in value. Basically, it is beneficial for both of you by you providing different things and you don’t have to provide any deposit. Method number five is to buy a really really really cheap house, like I listed inside On Property Plus a couple of months ago, just to show people that they exist. It wasn’t positive cash flow but just to show people that they do exist, a piece of land for $3,000. $3,000 for a piece of land. Granted, the land was in the middle of nowhere, there was no road to it, it was kind of very difficult to get to it. There was no sewerage line, no electricity, nothing like that. You couldn’t live on the land, but it was $3,000. I have seen land, I have seen houses in the back of nowhere under $50,000, $40,000, $30,000 for a completely run-down house. You could potentially purchase a really cheap property using the money that you have. A lot of people are trying to save the deposit and can’t quite save enough or maybe you want to buy a $3,000 block of land or $10,000 block of land which isn’t going to be as dodgy and you can provide that money up front. Now obviously, you got to have some deposit, but there is a circumstance where you may have credit card and you may be able to get a personal loan or something that is unsecured to go ahead and do that. Now, I’m not going to recommend this. I am never going to recommend that people get credit card deed or unsecured loans in order to do it. I am just saying it can be done. I am not saying you should do it or it’s a wise financial decision, because it’s probably not but you can do it and if you absolutely know what you are doing then that could be an option for you. The six method is what’s called property syndicates and surrounding you saving the full deposit yourself, investing in a property and having 100% ownership, you join a property syndicate where a bunch of different people come together to purchase investment property, but it’s a smaller investment amount on your part and it may be possible for you to purchase a property without a deposit assuming that you can get finance for something like that. Property syndicates do get a bad name because there was some dodgy stuff happening, I think back in the 90’s or early 2000’s where people got screwed over. So just make sure that you really do your research into the syndicate that you’re investing in before you go ahead and invest in it. If you want more detail about what a property syndicate is go to www.onproperty.com.au/syndicate and it will redirect you to a blog post that I’ve already done about property syndicate. The seventh method is property options and this is a very complicated topic and something I’m not going to go into in great detail. If you want to learn this in detail go to www.rickotton.com, an Australian guy who invests using this method and he is very successful at it. He’s going to be your best teacher. An option is basically where you go and you provide someone with the benefits and maybe a couple of grand up front to have the option to purchase that property if you want to at a dedicated price within a certain time frame. So if that sounds confusing to you then it’s probably not the best strategy for you, but if options make sense to you, then potentially you could go out and you could purchase an option on the property and if that property then goes up in value, then you may be able to purchase the property at the price set in your option and get the full finance for it because it’s worth so much more. Now, this is going be tricky with finance because banks like to be on the safe side so you are going to need to really work out how this is done before you go ahead and do it. It is however a possibility, so if you ask someone who is very [inaudible 9:27], willing to go out and make people offers to have an option on that property then this could be something that could work for you. The eight method which I really don’t want to talk about but I have read about it in the forums is that you can potentially get unsecured personal loans to help fund your deposit. Most lenders at the moment really want to see 5% savings before they’re willing to lend you any money. Therefore in most circumstances this isn’t going to work, but I have heard of people who got unsecured personal loans to help them with the deficit between their deposit and the property that they want to purchase. Again, this is not something I’m recommending because it is very risky to have that high-level of interest and to have all of those loans. If you don’t have a deposit maybe it means that you should step back and you should look at saving a deposit or you should go back to the last episode where we talked about the things that you can do now if you can’t really afford to save a deposit at the moment. The ninth method which I should list is that you can actually get a gift from a family member and purchase a property that way. So they gift you the deposit and you probably need a statutory declaration or stat dec to go along with that. But they gift you the money and you can then use that money to buy a property. Many parents do this with their children and that will give them money to get into the property market and so is a very common thing that you could do. Get a gift and use that to buy a property. If you’ve got generous parents like that, good on you, I wish you all the best. 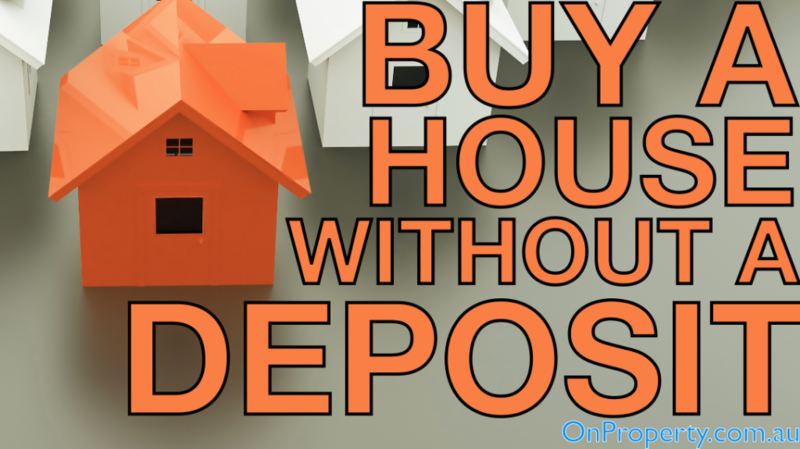 That finishes off for me today on ways that you can buy a property without a deposit. It’s much harder to do, especially here in Australia to buy a property without a deposit. However, it is still possible so you don’t need to give up. 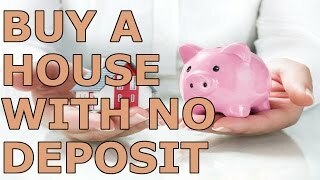 If you want to get access to my checklist to help you understand how much of a deposit you need to save and get you on the path to saving your deposit go to www.onproperty.com.au/save. You can enter your email and get access to that absolutely free.